Elizabeth Warren has a new op-ed at New Deal 2.0 arguing for, surprise, the Consumer Financial Protection Agency, but this time with a different emphasis – non-bank lenders. The opponents of the CFPA – not only banks, but the head of just about every current financial regulatory agency – argue that consumer protection should be combined with prudential regulation, so that one agency should be both making sure that a bank doesn’t collapse and that it isn’t abusing its customers. Many people have pointed out the flaws with this argument: first, consumer protection invariably slips down on the priority list; second, regulators become hesitant to crack down on abusive practices because those abusive practices generate the profits that make the bank “healthy” to begin with. In addition, this combination makes the fundamental mistake of regulating financial institutions rather than financial functions, and therefore lets abusive practices simply escape to unregulated institutions. Banking regulation in the U.S. has historically been focused on making sure that banks don’t collapse, so depositors can get their money back (without bankrupting the FDIC). The result was that non-bank mortgage lenders and consumer finance companies were notoriously under-regulated. 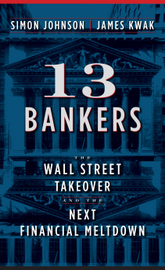 This created another opportunity for regulatory arbitrage: as Warren writes, “the Center for Public Integrity found that 21 of the 25 largest subprime issuers leading up to the crisis were financed by large banks.” In other words, banks outsourced their abusive practices to unregulated entities that they financed. How can that be a good thing? The CFPA is many things, but it is also an example of regulating a financial function rather than a financial institution, and therefore makes regulatory arbitrage that much harder; to get outside its reach, you have to define the thing you are doing as not a financial service. (Although I think it has a weird exception for insurance products, which could turn out to be a big problem.) Since regulatory arbitrage seems to have been a core business strategy of many financial institutions over the last decade, that seems to be a good place to start. This entry was posted in Commentary and tagged CFPA, Consumer Protection, regulatory reform. Bookmark the permalink. Give the CFPA real teeth, and double bank capital requirements. Then rent-taking will decrease, and excessive bonuses will just go away. Oh, and a 10-basis-point Tobin tax will put some of the taxpayer bailout money back into taxpayer’s pockets. Too-big-to-fail doesn’t need to be regulated away, if you can strangle it economically. Regulatory arbitrage is what is making banks (and non-bank financials) their profits. With respect to her op-ed, I thought that the big banks were getting into things like payday and microlending because the states were cracking down so powerfully on these kinds of things. Are you suggesting that the CFPA will be in a position to gauge the regulatory capital arbitrage practices of banks on the basis of how third parties deal with consumers? > … were financed by large banks.” In other words, banks outsourced their abusive practices to unregulated entities that they financed. i’m not sure what you are saying here. banks finance almost everything. are you saying that the banks had equity stakes in these companies? Though I agree with much of what is proposed here, and in Elizabeth Warren’s OP-Ed, I must say that if you are to get it right you have to be really sure of what went really wrong and I do not believe you are getting that completely right. Yes, the state regulators were indeed overwhelmed by the incredible demand for high risk mortgages that was created by the discovery that you could resell to investors, as worthy of a low interest, mortgages that carried a very high interest rate just because they were very risky, as long as you packaged them in an instrument able to get hold of an AAA rating. And so it does not necessarily mean that the current system was obsolete and bad but that the current system was subjected to an external shock it could not handle. And, the source of that external shock was the Basel Committee’s minimum capital requirements for banks and, the Basel Committee itself, was set up almost precisely for the same reasons you now advocate there should be a strong Federal regulator instead of many weak State regulators… and this should make you think twice at least. I have recently gone through all the motions to be a licensed mortgage originator here in the US, among other so as to be able to understand better what happened, and I totally agree with the description of the role of the non-bank agents you give here. Yet, most effective and most logical way to have stopped all this from happening is not having empowered the credit rating agencies at all. Without the AAAs there would have been no chance to pass of as good a mortgage lousily awarded. Something similar to that without a SEC there is no chance Madoff would have gone undetected for so long. Additional impetus for regulatory change will be forthcoming. We have not emerged. Things are still getting worse, not better. It might be useful to kick that ol’ usury rule back into gear again. Somehow I don’t think their hard hitting band of international investigative journalists and IF Stone would get along very well. Matt Taibbi gave us the “giant vampire squid” to coo over. This new PR machine, funded by the establishment itself, is giving us a less restrictive limited hangout. Well played, but still not cricket. Their CBoD has “cusinom tsilligom” written all over her. What are the chances she and Soros don’t admire eachother’s Tokaj collections? Anyone selling the notion this is about bribes is doing the credit rating agencies a great favor because this way you help them to take away the focus from the real problem, that of using risk assessments in establishing the capital requirements of banks. The real problem, no matter how incorruptible the credit rating agencies could be, is that following them will lead us sooner or later over a new cliff whether they are right and wrong in their assessments or not. And that is why it is so dangerous when only those who carry a political agenda or plain animosity under their arms take over the debate. You mean the one in the Bible? Since it is obvious that not one single of the millions of mortgages badly awarded 2004-2007 would have found one single investor to buy these, had it not been that they were packaged in securities rated AAA, it is also clear that this investigation by the Center for Public Integrity, though perfectly correct in its quite interesting findings, only helps to divert the attention from the real causes of the crisis. Is it on purpose? I have not the faintest idea. They have most probably been taken for a ride by some of their own natural biases. That said when they write “that U.S. and European banks poured huge sums into the subprime lending market due to unceasing demand for high-yield, high-risk bonds backed by home mortgages” they also show a profound misunderstanding of what really happened. There was never any demand for high-yield, high-risk bonds backed by home mortgages. The demand was exclusively for “slightly better yielding super-safe AAA bonds”. These faulty instruments were designed as very low risk for the very risk adverse and that is why the intermediation profits were so enormous. You gave high interest rate mortgages to very risky borrowers and then you peddled them off to very risk adverse investors as basically as safe as treasury bonds … “they got the same rating” and you pocketed the difference. Let me describe the deal for you in very simple terms. If you can convince Joe to take a 300.000 dollar mortgage at 11 percent for 30 years and then, with a little help from the credit rating agencies, you can convince Fred that the risk of this mortgage is so low that it is a good investment earning only a rate of six percent, then you can sell him the mortgage for 510.000 dollar, and pocket a tidy profit of 210.000 dollar. This 210.000 dollar profit was split between the originators and the packagers but the actual enablers were the credit rating agencies and those that enabled the credit rating agencies as enablers were the regulators. You see the story is quite simple if you just look at it from a straight angle. If I were the group of people behind it, I’d commission a study absolving me too. These faulty instruments were designed as very low risk for the very risk adverse and that is why the intermediation profits were so enormous. that the concept of a conventional bank was abstracted into a single financial instrument. As such, it was an end run around all banking rules and principles. Maybe someone has said this before. I am an early bird and so given the time of the day, sort of late for me, I am not sure I am following you. Let’s see, maybe the analogy is not exact. I was thinking about a traditional sort of bank that just held residential real estate mortgages. (The kind everyone thought was safe). These banks have a portfolio of mortgages, some good and some not so good. If you wanted to abstract this bank into its portfolio, then you get the mortgage derivative products. Of course the people buying the derivatives are not depositors, but you are telling them it’s as if they are. Except none of the mortgages went through rigorous underwriting, reserves were not kept (why should they be? ), and instead of deposit insurance they get the phony seal of approval of a rating agency. From my pedestrian perspective an asset, – let’s say a home has a certain market value determined by it’s size, accomodations, location, functionality, and certain unknown unknowns; (coolness factor, how many strippers or thugs live in the hood, access to freeways or masstransit, parks, shopping, views, et al.) These values would be (in a perfect world) determined by the markets and somethinglike supply and demand economics. Now add to this mix the packaging and tranching of mortgages, and all the irredeemable debt products that FALSELY drive up the price, or valuation of the original product and you have a FALSE market!!!! It’s a PONZI scheme. The market is not driven by the core asset, but the speculative manipulation of that market through the tranching and securitization of mortgage products that are packaged, and repackaged, and clouded in layers of mysterious dust, so that no one – neither the loan originators, nor the buyers of the products, nor the consumers, nor the actual home owner has any idea what is the actual value and intrinsice worth of the base product, the actual home. Here we are describing a toxic product, that no one can value, but that is wildly appreciated in value on paper by layers of murky, speculative, and I daresay criminal manipulation. Compound this horror through entire markets, and “Houston we have a problem”, “Obviously a major malfunction”. Assets must be valued on the markets interpretation of that products worth, NOT the markets interpretation of massive tranches of packaged mortgages sold and resold, and resold ad infinitum and adding wildly speculative and intrinsically FALSE valuations to assets that are shapeshifted from real properties with real values into irredeemable debt products whose true value is immeasurable, because NO ONE, – NO ONE understands or can accurately determine values. Inevitably once this PONZI scheme starts to tremble and fewer invesgtors step in to cover the margins, – the entire house of cards in DOOMED to collapse. Commercial Real Estate is the next tsunami that will certainly swamp the TBTF oligarchs. Until and unless regulatory agencies begin the arduous process of policing abusive and deceptive products and practices, and administrating brutal punishments to abusers, decievers, and wanton criminal, – there is no hope of real recovery, nor will there be any end to suffering and deprivation, not to mention loss of wealth of America’s poor and middleclass. Assets have real value. Iredeemable debt products have FALSE and MANIPULATED and SPECULATIVE values based on the whims of the predatorclasss oligarchs that brute and pimp these products as AAA investments. Yes, and the one that comes from a simple sense of decency. Per, thanks for the details. It’s a 41% profit!!! Some might call the financial transaction robbery. Per, does this mean: (1) a financial institution that issued the AAA-rated bond, by practicing fractional reserve banking, created more such bonds, (2) taxpayer funded bailout money is paying the interest on these bonds, (3) such bonds are now deemed toxic assets, so who can pay the bond holders when the bonds mature? And 41% over the quite short time it took to find the Joes to sign up on the mortgages and to package them as AAAs in order to sell them off to Fred. No do not confuse yourself on this with issues like fractional banking. What we have, the day after the deal is Joe, with a real liability of a mortgage of 300.000 dollar guaranteed with a house that might o might not be worth it; Fred, with a 510.000 dollar investment in the willingness of Joe to service his original mortgage at 11 percent on 300.000 for 30 year (gotta do a lot praying) and some originators/packagers still celebrating. But let me tell you the most surprising part and that is that sometimes the originators/packagers ended being the Fred who bought it because just the way you often do not know what you are buying, sometimes you can just as well not know have a clue about what you are selling. Are taxpayers paying the interest on the bonds? A ponzi scheme? Or both? What is going to happen when the bonds mature? Who will pay back the original value of the bond that is now deemed a toxic asset? What happened to the 41% profit? Fred buying Fred? Fred buying George? Sacked away in tax avoidance scheme in Switzerland? abusive practices generate the profits that make banks healthy. seems to me there is a flaw with that business model. I don’t know. If there is any justice in this world they might have been placed with Madoff. Thanks for this explanation. You’ve been blogging about the AAA-ratings as the primary issue for sometime. I agreed then and I agree now. This recent explanation, however, makes it more crystial-clear than ever the “power” that the AAA-rating had in this mess. It always did seem strange to me that a profit making company should be the ones issuing ratings.